I’m currently very backlogged, despite blogging on a very frequent basis. These recipes are made a couple of weeks ago and ‘ve only came about posting it up. Hehe.. So macarons, I guess the internet needs no further introduction on what this little French piece of cookie can do to tens of thousands of people across the world. I’ve tried a long long time ago, it was either too wet / soft (overbeaten) or …. ok well most of the time it’s too soft. One day, when the amount of egg whites in the fridge is dangerously too much, I decided to give it a go. Moreover, I had some leftover chocolate ganache from a cake and almond meal that probably has been too long in the pantry. Gotta use it up. I’ve been reading alot about these little fellas but it’s no use to just read and no output. There are a couple of good reads out there in the www , some of which are from Syrup and Tang, Not So Humble Pie and Tartelette. There are probably more out there, I’m sure. But anyways, I used Tartlette’s recipe and made the first batch. It was not good. I was stuck to the paper badly even though it was in the oven long enough to be considered as overbaked. So I thought, ok, maybe it was the paper Hrm.. So the 2nd time I used the same recipe again but I used a baking mat. With the baking mat, it came out pretty alright, but a little domed (now that I’m seeing it again.. ) But it wasn’t stuck and it was okay to remove after it’s cooled down. But the 2nd batch, I used a different baking time and method, so it could probably be that reason too. These little fellas … we all know how temperamental there are!! But I refuse to believe so. !! 1. In a stand mixer fitted with the whisk attachment, whip the egg whites to a foam, gradually add the sugar until you obtain a glossy meringue. Do not overbeat your meringue or it will be too dry. 2. Place the powdered sugar, almonds and espresso powder in a food processor and give them a good pulse until the nuts are finely ground. Add them to the meringue, give it a quick fold to break some of the air and then fold the mass carefully until you obtain a batter that falls back on itself after counting to 10. 3. Give quick strokes at first to break the mass and slow down. The whole process should not take more than 50 strokes. Test a small amount on a plate: if the tops flattens on its own you are good to go. If there is a small beak, give the batter a couple of turns. 4. Fill a pastry bag fitted with a plain tip (Ateco #807 or #809) with the batter and pipe small rounds (1.5 inches in diameter) onto parchment paper or silicone mats lined baking sheets. 5. Preheat the oven to 280F. Let the macarons sit out for 30 minutes to an hour to harden their shells a bit and bake for 15 to 20 minutes, depending on their size. Let cool. 6. 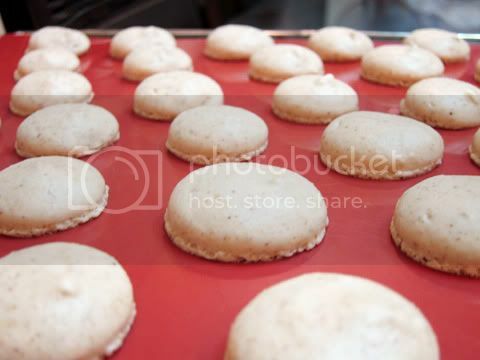 If you have trouble removing the shells, pour a couple of drops of water under the parchment paper while the sheet is still a bit warm and the macarons will lift up more easily do to the moisture. Don’t let them sit there in it too long or they will become soggy. 7. Once baked and if you are not using them right away, store them in an airtight container out of the fridge for a couple of days or in the freezer. To fill: pipe or spoon about 1 big tablespoon of butterceam in the center of one shell and top with another one. *pulsing almond meal and icing sugar is just as important as making sure there’s no impurities in the egg whites. 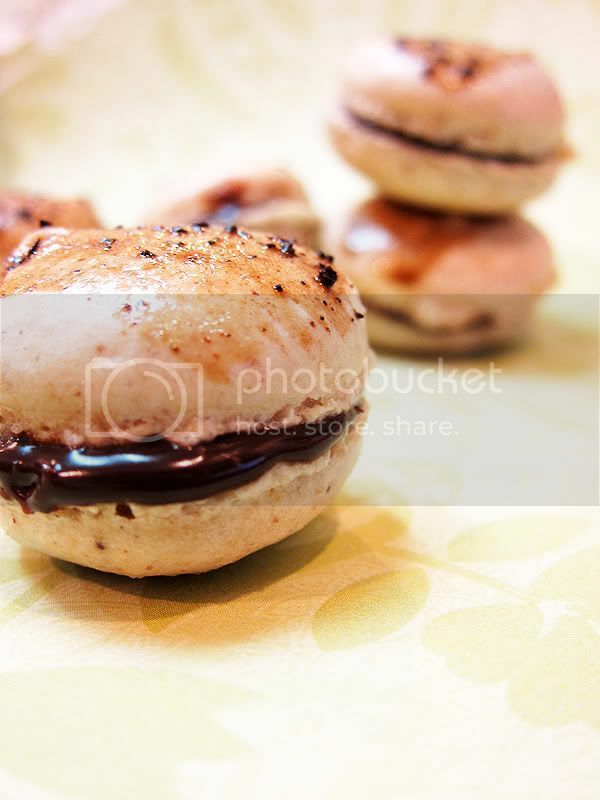 What I found is that if you pulse them, the shell of the macaron is smoother and the texture is not as grainy as without. *I think the whole macaron thingamajig relies on the folding method. I’m still figuring which way is better so at the mean time, it’s more like try and error. 2. Pipe cooled chocolate ganache on one of the shell and sandwich it with another macaron shell. I found out that it’s probably because of my almond meal that the macarons had a less crunchy shell; it was oily. Hence I would probably keep my almond meal in the fridge next time ? 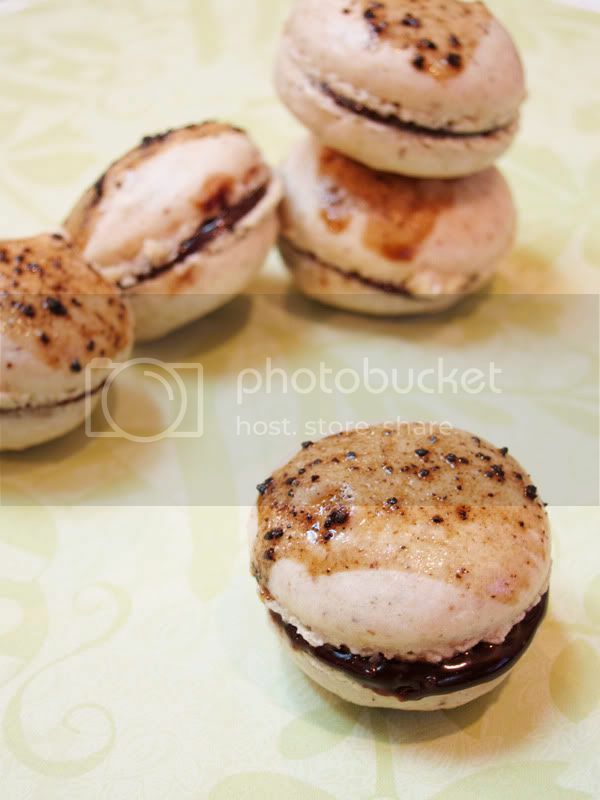 I've never baked nor tasted macarons before. Very tempted to. 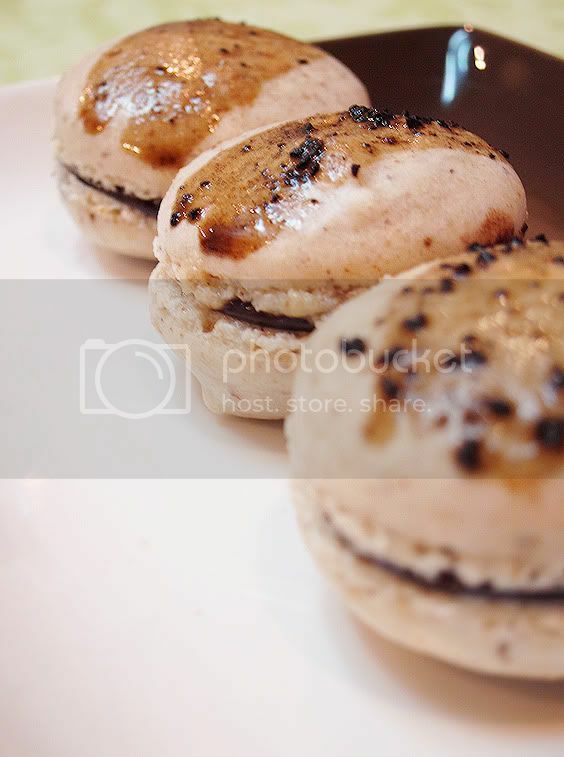 this remind me I have so long did not make macarons, yours look gorgeous! Oops! I think I'm a lil' late here … I FINALLY got to see how your macs looked like … Actually, VERY GOOD!! Aren't they temperamental!!?? Argh …!